The mitochondria – the powerhouses of our cells – play a vital role in the pathogenesis of diabetes. In the words of a very recent review, there is now evidence to indicate that diabetes and its complications result at least partially from pathogenic processes at the mitochondrial level. If we can understand what these pathogenic processes are, we have all the more chance of working out what can be done to correct them. Professor Denis McGarry asked at the beginning of his famous Banting Lecture in 2001, after a lifetime of studying diabetes: I sometimes think that the question of what causes type 2 diabetes might be one of the most frequently asked and least satisfactorily answered in the history of diabetes research. Perhaps a mitochondrial perspective can help approach an answer in areas where a glucocentric or lipocentric perspective has not done so far. Excess glycaemic calorie intake is certainly a starting point: this is so common in our current lifestyle. High calorie/high glycaemic intake causes an intensive rate of substrate input along the electron transport chain that generates our high-efficiency adenosine triphosphate (ATP) for energy within the mitochondria. This is known as a high proton-motive force. However, this is often combined with low energy expenditure: how often are we fleeing from lions (or the equivalent) in terms of energy output? Our sedentary lifestyles mean our ATP generation is often more than we are actually able to use. If this continues unabated, the reactive oxygen species (ROS) generated along the electron transport chain can build up more than we have antioxidants to quench. If this happens, they damage proteins, DNA and lipids in membrane components, eventually resulting in mitochondrial dysfunction. Plus we lose the ability to produce ATP efficiently. One strategy of the mitochondria when this happens is to release a quantity of the potential energy that builds along the electron transport chain just before conversion into ATP using uncoupling proteins. This leads to membrane depolarization and can eventually shut down mitochondrial ATP generation. This protects the mitochondria from excess oxygen radicals that would otherwise destroy them, but the disadvantage is that downregulated mitochondria mean energy has to be generated in the cytosol instead, along an emergency generator pathway that is not intended to be used long term. Cytosolic energy production is very inefficient (only 2 ATP per mole of glucose instead of around 36). Easy then to understand the fatigue of diabetics, and in many cases the sense of needing to eat (hyperphagia). The body is starving, energy is not going into the cells efficiently, but does not do so however much is eaten. The situation now becomes a vicious cycle, as when the mitochondria are down, the key substrate the body uses for energy is glucose. So now we have larger volumes of glucose being ferried into the cells. The cells however are aware that they do not wish to be exposed to high levels of glucose long term. Just think of HbA1c, a marker of diabetes: this glycated haemoglobin rises higher the more plasma glucose we are exposed to – basically sugar attaching to our red blood cells, partially blocking their functionality. Our cells are programmed to protect the organism at all costs, and will do their best to resist the damaging effects of high blood glucose levels. The solution, from the cells’ point of view, is insulin resistance – stop the glucose from getting into the cells. Another pathway that stops working when the mitochondria are downregulated is the body’s natural way of burning fats: the beta oxidation pathway. 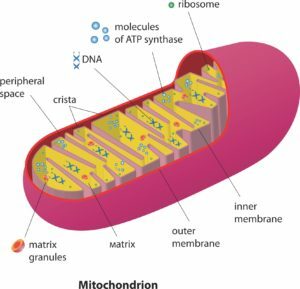 This is in the mitochondria, so if the mitochondria are down, this will no longer be functional. If you cannot oxidize lipids in the mitochondria, you develop higher levels of free fatty acids accumulating both in the blood plasma (elevated triglycerides) and elevated intramyocellular lipids (lipids in the muscle, where they should not be). This free fatty acid excess is a key factor in impairing insulin secretion – this may even be part of the body’s intelligent feedback system, as these elevated lipids are a signal that the mitochondria are down, and blood glucose is going to rise. It is now apparent that elevation of plasma free fatty acids plays a pivotal role in the development of type 2 diabetes by causing insulin resistance. Not to forget that sugars form a large part of the substrate for our triglycerides anyway, not just fats. So both the sugars and the fats that can no longer be burnt in the mitochondria because they have shut down now build up around the body in adipose tissue, and as intramyocellular lipids. Free fatty acids when circulating result in very significant suppression of insulin-mediated glucose uptake, correlated most tightly with intramyocellular lipids. Protection is always the key: Most cells are able to reduce the transport of glucose inside the cell when they are exposed to hyperglycemia. Certain cells in the body however are unable to do this when exposed to hyperglycaemia: capillary endothelial cells in the retina, mesangial cells in the renal glomerulus, neurons and Schwann cells in peripheral nerves. These are the cells and organs often damaged first in frank diabetes. Again, the mitochondria are (unwittingly) the key player. As Michael Brownlee describes in â€œThe pathology of diabetic complications: a unifying mechanism, the backlog along the electron transport chain discussed at the outset cannot be released by the emergency blowout mechanism, leading to more ROS than the mitochondria are able to quench with antioxidants. These ROS damage proteins, DNA and lipids in membrane components of the mitochondria. Brownlee suggests that mitochondrial dysfunction occurs as a unifying mechanism for microvascular and macrovascular complications through the production of ROS. Arguments are rife within academia as to whether the glucocentric or lipocentric view is most important in explaining the pathogenesis of diabetes. Perhaps we should simply think about it as mitocentric. Caring for your mitochondria targets the essence of the problem, and can help to restore cell functionality. How to do that will be the subject of a future article. Chen X, et al. Mitochondria in the pathogenesis of diabetes: a proteomic view. Protein Cell. McGarry, JD. Dysregulation of fatty acid metabolism in the etiology of type 2 diabetes. Treatment. Altern Med Rev. 2002;7:94-111.